The F5 Big-IP Edge client provides a secure connection for accessing an @northwestern.edu (Exchange) email account using Outlook. If you are a Feinberg faculty, staff member, or student, you are required to use this VPN client before accessing your email account, whether you are on campus or off campus. 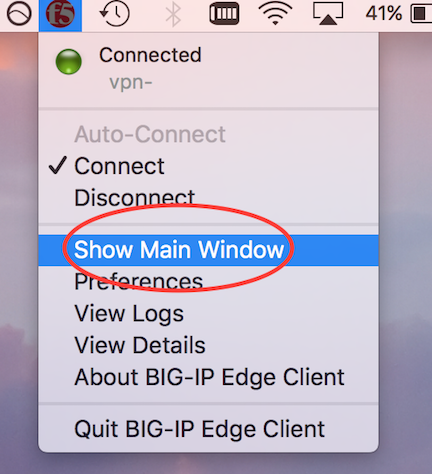 Because Big-IP Edge is used only for email access, you will still need to use traditional VPN to connect to shared drives and other University resources (e.g., Kronos) when you're off campus. When the F5 Big-IP Edge client was pushed to your University computer, it was preconfigured with the appropriate server information to allow you to connect easily. Your computer settings were also modified to automatically open the client when you turn your computer on. All you need to do is add your NetID and NetID password to complete the configuration. 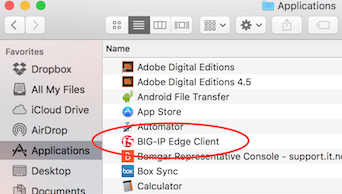 To have your personally-owned Mac configured to use the F5 Big-IP client, contact Feinberg IT at fsmhelp@northwestern.edu. If you see an F5 icon in your menu bar, click it and select Show Main Window. If you don't see the icon in your menu bar, navigate to your Applications folder to find the client, then double-click it to open it. If this is the first time you're using the client, enter your NetID as the Username, and your NetID password as the Password. Make sure the Save checkbox is checked to save this login information. If you have changed your NetID password recently and need to update this info in the client, delete the existing password and enter your new one. Click Logon. 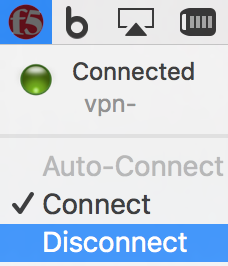 The icon in your menu bar will turn red to indicate you're connected. When you're done using the client, click the red F5 icon in the menu bar and select Disconnect. The icon's color will change from red to gray once you're disconnected. If you see an F5 icon in your menu bar, click it and select Connect. The icon's color will change from gray to red once you're connected. Navigate to your Applications folder to find the client, then double-click it to open it. Click Logon. Once you have opened the client, you will see its icon in the menu bar. The icon's color will change from gray to red once you're connected. From the Server drop-down menu select Add New Server. 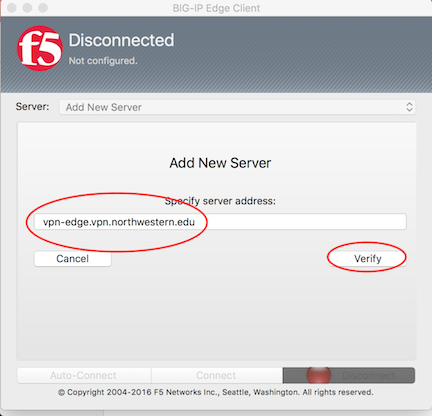 Enter vpn-edge.vpn.northwestern.edu, then click Verify. Once verified, enter your NetID as the Username, and your NetID password as the Password. Make sure the Save checkbox is checked to save this login information. Then click Connect to connect to the server.